Synopsis: Over twenty-five years ago, Liam Tate and Acadia McCormick Knox fell in love. It was summer on Nantucket, and eighteen-year-old Liam knew that wealthy, college-bound Cadie was way out of league for a local boy who restored boats for a living. Yet the two became inseparable, seizing every chance to slip away in Liam’s runabout to secluded spots, far from the world that was trying to keep them apart. My take: Nantucket is the story of Liam and Cadie. We learn about their history in chapters that alternate between 1989 and the present. Usually when this technique is used in a novel I prefer one time period over the other but Nan Rossiter did it flawlessly and I was engrossed in both. I loved Liam’s willingness to open himself to Cadie and her family when it would have been so much easier to keep living his closed-off life. Cadie risked a lot by coming back to Nantucket but she knew she had to do it. I was also charmed by the children in the novel. They added so much to the emotional tone of many scenes. Of course, I loved the Nantucket setting. The passages describing Liam’s job of building and repairing boats were interesting and, at the same time, helpful in the understanding of Liam himself. 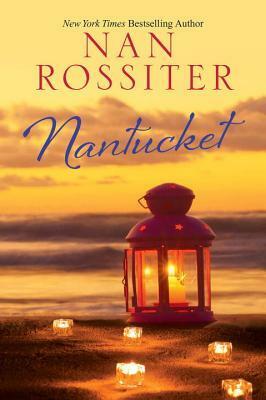 Nantucket is an emotional and romantic story of love, forgiveness, trust and second chances. I really liked it and recommend it to fans of Nan Rossiter and women’s fiction.